Chelsea youngster Callum Hudson-Odoi was the "only" player Bayern Munich wanted to sign in January, according to club CEO Karl-Heinz Rummenigge. Bayern made no secret of their desire to sign Hudson-Odoi, with the 18-year-old winger reportedly frustrated by a lack of opportunities for Chelsea in the Premier League. An Under-17 World Cup winner with England in 2017, Hudson-Odoi is very highly rated by Chelsea and they are said to have rebuffed several bids for him from Bayern. The final offer Bayern are reported to have lodged was worth around £35million, but Chelsea have dug their heels in regarding any deal, adamant he will not be leaving. Maurizio Sarri said he had been assured the club would not approve a sale of Hudson-Odoi, and as such Bayern sporting director Hasan Salihamidzic has been left disappointed. 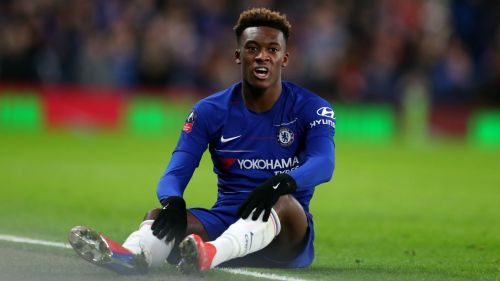 Speaking at a news conference on Thursday, Rummenigge said: "The only one Hasan would have liked to buy was this player [Hudson-Odoi] from Chelsea. "I have to say that he nearly fell in love with this player and his qualities. All the other things [stories about transfer links with other players] were rumours. "We don't have any demand on these positions for the second half of the season. This is a topic for the future. We'll handle it in the next months and will decide. "I won't deny that they [Chelsea] didn't like this so much [Bayern's open pursuit of Hudson-Odoi], but don't forget that you have to give a signal to the young player [that you want him]. "There was no personal contact with the player because this is not permitted. I think that was noticed. The player had to have a signal that Bayern is standing completely behind him."